The VG6 GAMMA 762 is a high performance muzzle brake for eliminating recoil. It was designed using state of the art engineering techniques, utilizing CFD (Computational Fluid Dynamics) and CAE (Computer Aided Engineering). This product is 100% CNC machined for optimal performance. 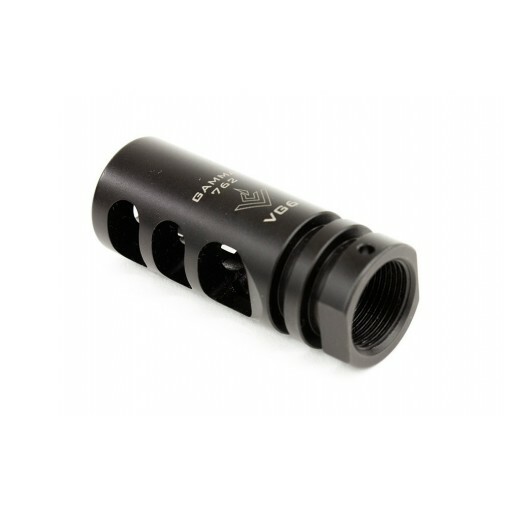 The VG6 GAMMA 762 is a muzzle brake and compensator hybrid. It virtually eliminates recoil and minimizes muzzle movement. The unique combination of both braking and compensating features inspire shooter confidence and allows the shooter to make very fast follow up shots. Its unique chamber geometries give it a very soft feel in the shoulder and the gas ports dimensions have been strenuously tested to give the utmost control to the muzzle. Black Nitride finish.